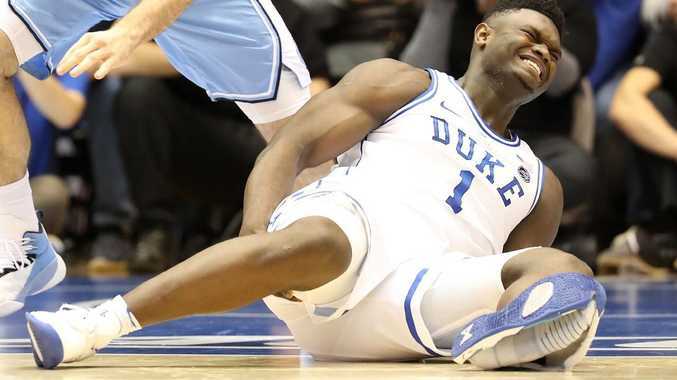 Zion Williamson grimaces in pain after his Nike shoe exploded. As a sneaker company, Skechers is nowhere near Nike when it comes to popularity but they are throwing some serious shade at the Oregon empire in the wake of projected NBA no.1 draft pick Zion Williamson exploding his shoe against North Carolina. Yes, many have moved on now - it's been more than a week since Williamson's shoe exploded while playing for Duke - but not Skechers, who continue to troll Nike at every turn. After using an ad campaign that used the slogan "Just Blew It" against Nike on Instagram, the company took out half page ads in the Wall Street Journal on Saturday and The New York Times on Sunday. At the time of the incident Puma took their shot in a since deleted tweet, claiming "Wouldn't have happened in Pumas." Williamson, who suffered a sprained knee in the incident has missed the last two games and is expected to sit against Miami on Saturday. The initial incident was not only a bad look for Nike but their share price reportedly dropped by $1.1 billion in the wake of the shoe blowout. Potentially Nike's chances of signing Williamson after the NBA Draft were also damaged. ESPN's Jay Williams said at the time that the teen beast is in line for an $AUD1.4 million shoe deal. Still Nike having shade thrown at them by Skechers, who aren't even in the NBA market, is hilarious and the best response Nike could give would be to simply ignore the ad campaign, which it seems they are doing. This isn't the first time Skechers has been in the news for interacting with another shoe company either. The group also filed a lawsuit against Adidas in May of 2018, claiming Adidas created false advertising and unfair competition by funnelling hundreds of thousands of dollars in secret payments to high school and college basketball players and their families to wear its products.